Hi:) I’m just being random here. Just letting you guys know, this wordpress is being run by 2 people, not only me, but my other friend too. We have this wordpress as we have the same hobby but different dream:( and I don’t know what her dream is though… Anyway back to the point, it is weird that both of us are sharing one account rather than creating a new one. I also have no idea why we did that but we just did that haha LOLz XD So if you really notice it, the posts that my friend post are more random and personal while those that I post are more about Korea stuff:) She does post korea stuff too such as the TTMIK post is done by her…. in fact that’s the only post from her related to korean language lol. So yeap i shall post up all these random stuff….. I am just being random and bored here. I love a lot of korean variety shows, but which one do you think I like the most? I have a dream, a dream that I have dream for a long time, a dream that I believe, a dream that I will hold on to no matter what happens. I will always work towards my dream despite all the difficulties I face. I will prove to everyone that I have the right dream. Why does people always say my dream is a useless dream? What is wrong with trying to be what I want to be? I really don’t get it, I really don’t. Why is everyone laughing at me for dreaming? What is a good dream to them then? Give me an answer, answer me. I have a dream, a dream that I have dream for a long time, a dream that I believe, a dream that I will hold on to no matter what happens. I will always work towards my dream despite all difficulties I face. I will prove to everyone that I have the right dream. Is it because of my look that I should not have that dream? Or is it because of my lack of ability to achieve my dream? Why is it useless, my dream. Does dream only belong to those who have talent? If you have no talent, should you not even dream? Sometimes I wonder, I wonder. The 1st place that I will be introducing is Seoul! 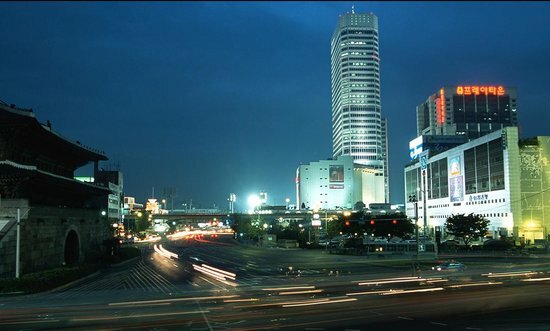 Seoul is the capital and largest metropolis of South Korea. 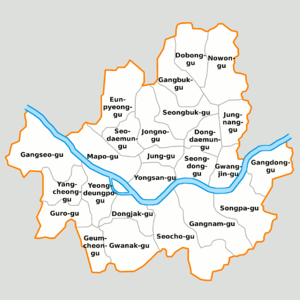 Seoul is divided into 25 districts. They are listed below. It is a shopping paradise. The largest market in South Korea, the Dongdaemun Market, is located in Seoul. Myeongdong, where all the fashion boutiques and international brands are all located there. Also the namdaemun market which is the oldest continually running market is in Seoul. For younger people to shop, there is the Sinchon. Insadong, where it sells all the traditional stuff about Korea, and Itaewon, caters more to tourists. Most important, there is the Times Square, with the largest shopping mall in Seoul, and the largest cinema. About this blog…. as the tittle suggests, Im going to post all the awesome korea things, such as its culture, some awesome places to visit, and its language.